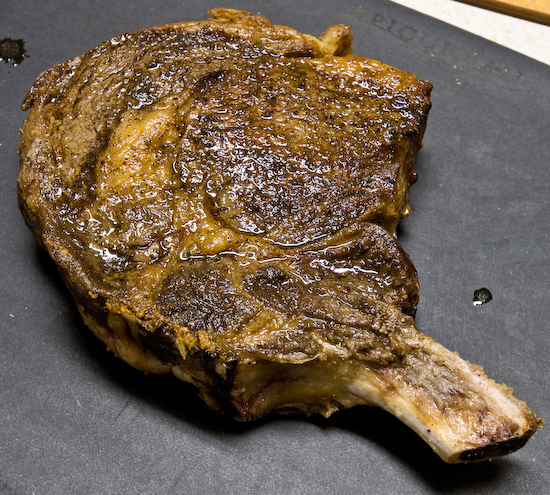 Dinner: I cooked a large (2-1/2 pound) USDA Prime bone-in ribeye steak. Low and slow in the oven at 200°F until the interior was a little over 130°F. Then I finished it on the stove top in a fry pan with half a stick of butter. This piece had the largest spinalis dorsi (the ribeye cap) that I've ever seen. I trimmed the cap off the ribeye and served that to Tina and myself. This is the best steak I've cooked since moving to Texas and one of the better ones I've ever done. I'm especially proud since I previously did steaks only on the grill (which I don't have anymore) and it's been difficult for me to get my steaks to where I like them to be with my indoor cooking equipment. 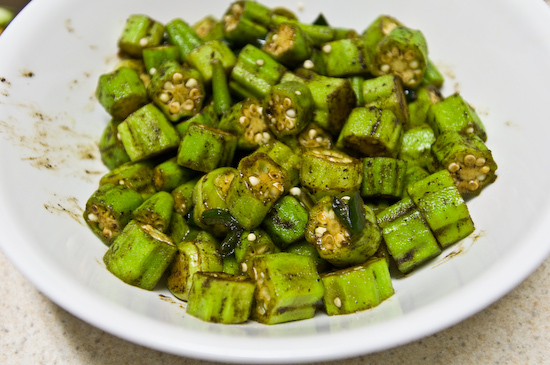 I sauteed fresh okra pods that I purchased yesterday with a chopped up jalapeno chile in the butter that I used to form the crust on the steak. The beef and the okra together made one of the most satisfying dinners I've had in a while. Lunch: We each made ourselves a platter of assorted meats and veggies. 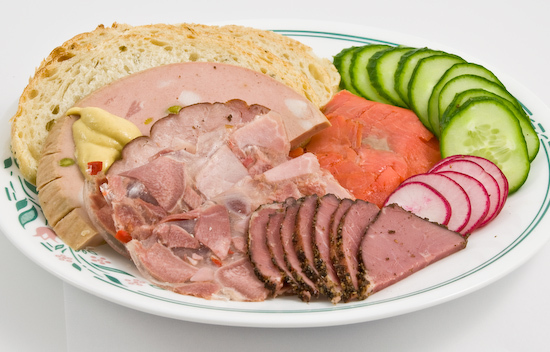 I had a few slices of Rosemary Olive Oil Bread, Olive Mortadella, Head Cheese, Pastrami, Smoked Sockeye Salmon, Radishes, and English Cucumber with a small dollop of Grey Poupon white wine mustard. It sounds like a really good home cooking day. What made you do the "start low finish high" method versus the usual "start high finish low"? The size of the cut. With a thinner cut, the sear is more important for flavor - so I execute that first. The steak might not be able to handle much more than a sear. With the thicker cut, I could do the sear first, then slow cook or vice versa and it wouldn't make a difference. I find it easier to bring it up to the temperature I want in the oven first and then let it cool a little bit (or a lot depending on when I'm ready to eat) before frying it in the pan to finish.